15 February 2017.- The European GAINN projects (GAINN4MOS and GAINN4SHIP INNOVATION) are being exhibited this week at the “BILOG Logistics & Maritime Forum”. The general coordinator of the projects, Eva Pérez and the communication manager, Marina Sáez have travelled to Piacenza to present the GAINN action together with other project partners from Italy. Moreover Eva Pérez has participated in the panel “Technological innovation for green shipping: focus on new alternative fuels”. She has presented the speech: “Scenario Analysis for the Use of LNG as Marine Fuel in the Western Mediterranean. The case of the GAINN key pilot projects”. BiLOG is the brainchild of La Spezia Port Authority and Piacenza Expo in order to create a special occasion to discuss on logistics and transport topics with a European spin. The Forum will analyze both the regional and European dimension, giving the possibility to improve the knowledge about EU Transport Policy and EU investments on transport and maritime sector, highlighting the importance of the cohesion between all the players of the logistics chain. 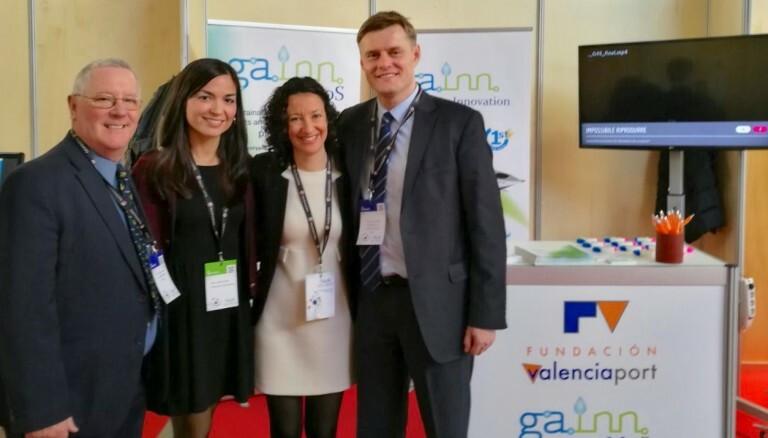 Image caption: Marina Sáez and Eva Pérez at the GAINN projects stand together with Brian Simpson, EU Coordinator for MoS and Wojciech Sopinski, Adviser to EU Coordinator for MoS.